More than 300 wild reindeer have been killed by lightning in southern Norway, officials said Monday, in the largest such incident known to date. The 323 reindeer, including 70 young, were found on Friday by a gamekeeper on the Hardangervidda plateau, a national park where Europe's largest herd of some 10,000 wild reindeer roam freely. Television footage showed the animals' dead bodies lying close together on the ground. "There were very strong storms in the area on Friday. The animals stay close together in bad weather and these ones were hit by lightning," an official from the Norwegian Environment Agency, Kjartan Knutsen, told AFP. Reindeer are social creatures and usually move in packs. "It's unusual. We've never seen anything like this on this scale," Knutsen said. Norwegian authorities have yet to decide what to do with the animals. "We're going to decide soon whether to let nature run its own course or whether we will do something," he said. Of the 323 reindeer killed, five had to be put down due to their injuries. 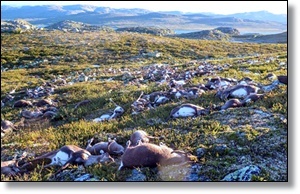 Thee are some 25,000 wild tundra reindeer in Norway, located in the southern mountain ranges, according to experts.